Please stay at Aria the next time you are in Vegas! Hi guys! Back from vaca, holiday, etc., and do I have a recommendation for you! We were in Vegas (my mom lives there), and sometimes I stay on the Strip to take a break from the burbs. 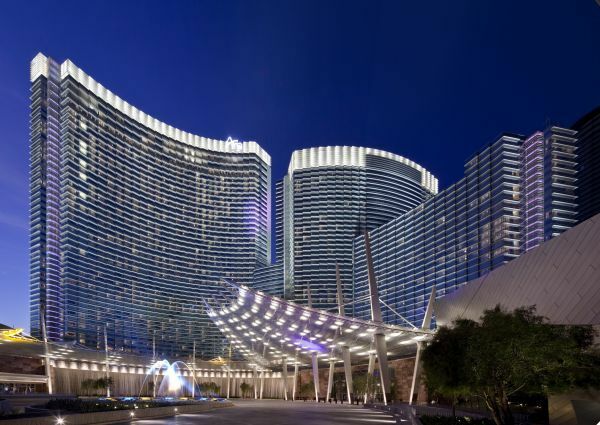 For the first time, we checked in at Aria, which is now my new fave hotel in that city. Sophisticated and classy, it lacks the schmaltz of theme-oriented spots as well as the scene-y pretension of places like The Cosmopolitan. Yes, there is a casino on the ground floor. But overall it is an oasis of calm featuring natural wood, stone and foliage in the lobby, and modern, sleek decor in the rooms. 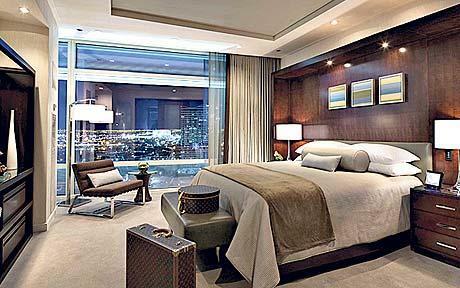 When you walk into yours, the curtains open automatically; in fact, almost everything (television, lights, temperature, room service) is controlled via a touch screen panel (which turns off devices when not in use). With Aria’s commitment to reducing energy consumption, its 4,000+ rooms make up the largest LEED-certified hotel in the world. And in case you need to undo any Vegas-indulgence damage, the gym is the best I have ever seen at a hotel: HUGE, with natural light streaming in and dozens of cardio options, weight machines and free weights. With a gorgeous spa, five pools, seven bars and 16 restaurants (Including Julian Serrano tapas, the brand-new Javier’s Mexican and Todd English PUB, which is not technically part of Aria but onsite at CityCenter), Aria may even make you forget about poker. And that’s my kind of Vegas. Nightly rates from $100 (but more like $140 with resort fee and taxes). Car rental in NYC is obscenely expensive. Even short-term services like ZipCar or Hertz on Demand can cost $175 for 8 hours (totally negating your outlet-mall savings). But RelayRides lets you rent from regular people who happen to not be using their cars. It’s free to sign up—just submit your driver’s license to be fully screened—and then specify when you need a car. Once the owner approves you, pick up your ride and run your errands (aka make an appearance at your cousin’s baby shower in Poughkeepsie). In NYC, cars average about $15/hour (some for as little as $10/hour, with larger SUVs and luxury cars going for $20+/hour). In Boston I see listings for as little as $8/hour. This is a national service in about 20 major cities. RelayRides isn’t meant for super-far destinations or overnight trips. Some owners limit mileage (max of 200/day seems standard). But insurance is included in the cost; you just replace gas. So, everybody wins: Owners make extra cash, the environment is happy and you get a great pair of shoes on sale. Peer-to-peer sharing makes me love humanity—I wheelie mean it! No, this isn’t for a magnum—it just looks big. Not that I ever check luggage anymore, but if I did, and if I happened to be visiting wine country, and if I discovered an amazing bottle of wine, and if I purchased one or two extras to bring home so I could relive the deliciousness, I would totally invest in a few WineSkins. 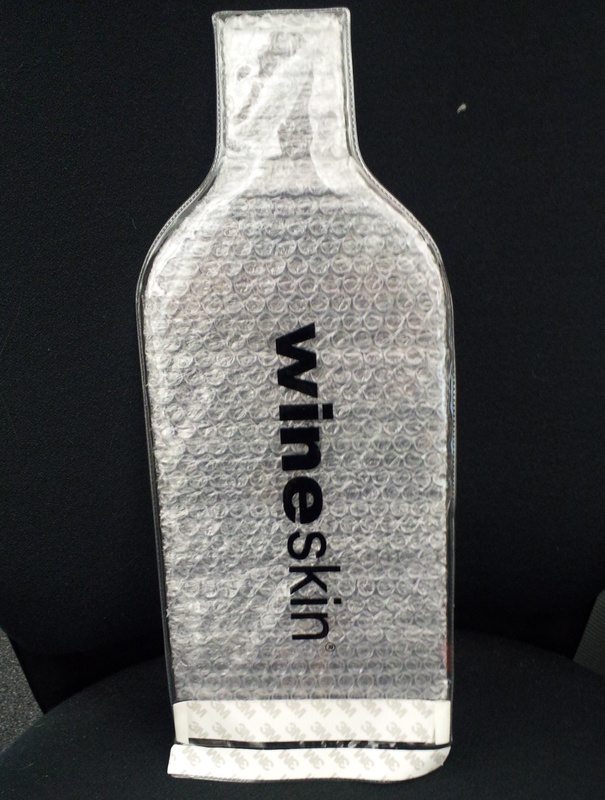 These plastic, bottle-shaped envelopes protect your wine (and everything else in your bag), first with cushiony bubble wrap and then with two separate seals. (You can also stuff them with glass bottles of olive oil, vinegar or anything else.) Although not reusable, they’re super cheap: just $10 for three. Find where to buy near you—and get packing! Hyatt wants you to stay skinny! Or maybe just healthy. But on a recent stay at a Grand Hyatt, I found the coolest thing in the hotel gym: a little tiny card that outlined local running routes! Now, this was not a woodsy, mountainous or beachy area where trails would be obvious. It was in a city, and I probably would have stuck to the treadmill without this mini-map. 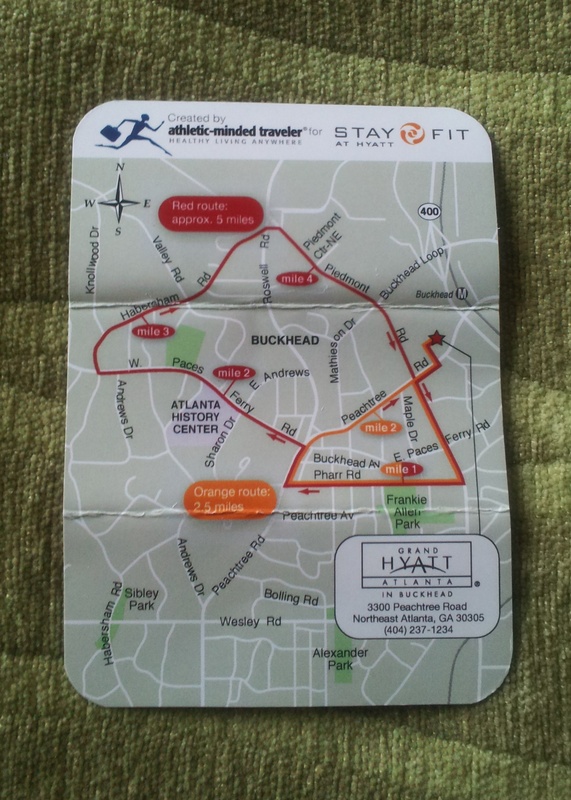 A partnership with Athletic-Minded Traveler, the card highlighted two routes: a 2.5-miler and a 5-miler, along with other well-labeled streets in case I got lost. Best part: It was small enough to be zippered into the pocket of my workout shorts, and it was laminated/sweat proof! Plus, it had the hotel’s phone number in case I got lost. So I left my cell phone in the room and hit the pavement. In addition to suggested running routes, Stay Fit at Hyatt includes 24-hour gyms with upgraded fitness machines and equipment like body bars, resistance bands and medicine balls, plus in-room yoga programs and even GPS watches available on loan. I love you, Hyatt! Thanks for letting me eat flatbread without becoming a fathead.